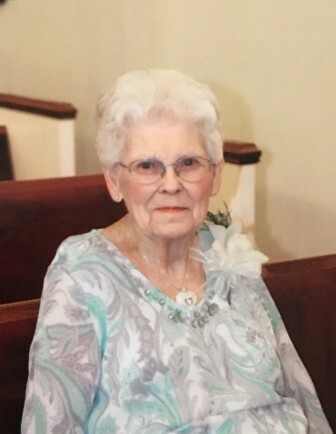 Ms. Mable Louise Tarte Green, age 90 of Cerro Gordo, entered into the arms of her Savior early Wednesday, March 27, 2019 at Lower Cape Fear Hospice, with her family by her side. Born in Cerro Gordo on the twenty-third day of October in 1928, she was the daughter of the late Collier Foster Tarte and Smithie Blanche Brown Tarte. Ms. Mable was the widow of the late Hewitt Green, who preceded her 15 years ago. Also, preceding Ms. Mable in death was three of her siblings, Jimmy Tarte, Phillip Tarte, and Willadean Woodard. Funeral Services celebrating Ms. Mable’s life will be conducted at 3:00 p.m. on Saturday, March 30, 2019 at Cedar Grove Baptist Church, with Pastor Jeff Stocks officiating. Internment will follow in the Gowen Cemetery in Cerro Gordo. Visitation will be held on Saturday from 1:00-2:45, prior to the service at the church. Ms. Mable was a member of Cedar Grove Baptist Church and attended faithfully. She was a kind and compassionate woman and always shared her loved with those around her. Survivors include her son; Perry Wayne Green and wife, Janet of Monroe; a daughter, Angela Green Miller and husband, Larry of Cerro Gordo; a brother, Billy J. Tarte of Leesville, SC; six grandchildren, Nina Curry (Jeffery), Kendel Cichocki, Brenna McLain (Justin), Resa Green, Kaitlyn M. Small (Brandon), Jackson Miller; eight great-grandchildren, Austin, Klaire, Spencer, Ethan, Aaron, Benjamin, Alex and Alissa.